American Pharoah and Victor Espinoza cross the finish line 5 1/2 lengths in front of Frosted. It only took 37 years, but today, American Pharoah won with a wire-to-wire run, pulling out at the end to win by 5 1/2 lengths over Frosted. That horse has an amazing gallop — he just floated around that track. In fact Victor Espinoza said the horse is like riding a cloud. The winning time of 26.65 is the 6th fastest Belmont Stakes ever. Only Secretariat, Easy Goer, AP Indy, Risen Star, and Gallant Man ran faster. American Pharoah was the only horse in the Belmont who had run in all three Triple Crown races, proving the skeptics wrong who said that the races did not allow enough recovery time. Winning the Belmont Stakes put an additional $800,000 in owner Ahmed Zayat’s pocket, but with the Triple Crown win, Forbes puts Pharoah’s worth at an estimated $50 million, with his stud fee anticipated to be $75,000 – $100,000. As a point of reference it costs $30,000 just to enter the Belmont Stakes. The $1,500,000 purse is split so that the winner receives $800,000 to the winner, the second place finishr receives $280,000, third place receives $150,000, fourth place receives $100,000, fifth place wins $60,000, sixth place receives $45,000, seventh place receives $35,000 and the eighth place finisher receives $30,000. 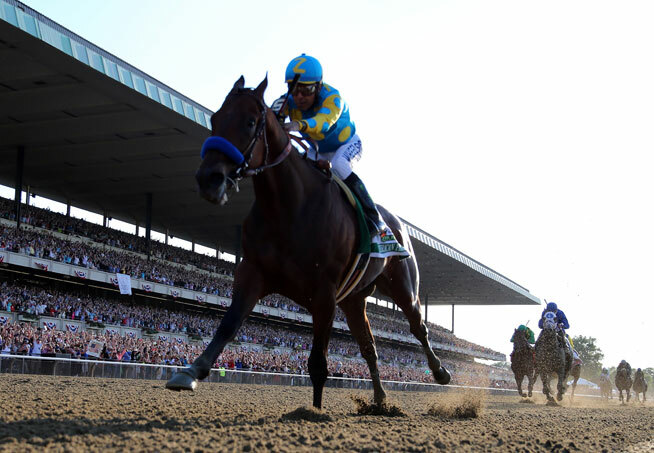 Will American Pharaoh Pull off a Triple Crown Win? We heard from all his human handlers about his remarkable victory but I keep wondering what was American Pharoah thinking about his win? With all my years of watching racing, I don’t remember seeing such a well-muscled horse as American Pharoah. He makes it look so effortless out there, I wonder if we’ve yet to truly see him at under full speed. Had a feeling he would be our next Triple Crown Winner. Glad he was!